For the long-suffering fans of the Toronto Maple Leafs, the year 1967 has become synonymous with past glories and forty years of failure. On Saturday night, the surviving members of the last Leaf team to win the Stanley Cup were reunited at the Air Canada Centre for the first time since that storied championship. An Alex Trebek-narrated video tribute began the proceedings, in what turned out to be a relatively simple, modest, and perhaps dry ceremony as the now-fabled squad was trotted out one by one to centre ice by public address announcer Andy Frost. For the oldest team to ever win the Stanley Cup, it’s a small miracle that so many are still alive. 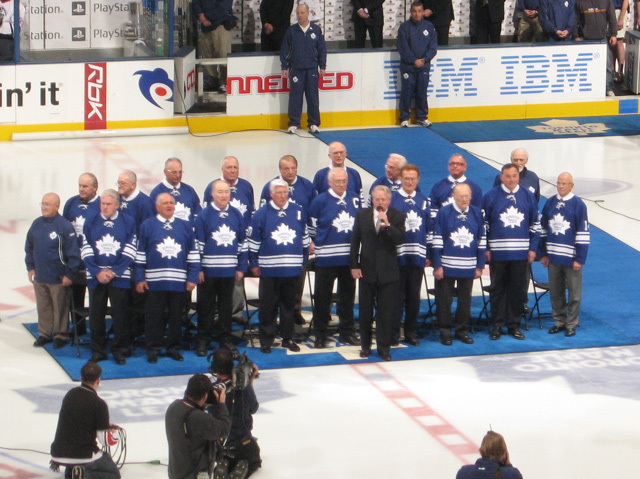 There were the Hall of Famers (Frank Mahovlich, Johnny Bower, Red Kelly), the clutch performers (Allan Stanley, Ron Ellis, Bob Pulford), and the unsung heroes (Larry Hillman, Brian Conacher, Pete Stemkowski). It was safe to say that most of the people in the building had never seen these men in their prime. But the crowd was on their feet from the get-go, unusual for the typically reserved ACC patrons more interested in their Blackberries and sushi. The big story of the evening was the return of Dave Keon, former prodigal son and Conn Smythe trophy winner (for Stanley Cup playoffs MVP) who later, in a bitter dispute with cantankerous owner Harold Ballard, turned his back on the franchise. Saturday night would be his first formal appearance for the Maple Leafs in over thirty years. Upset at the franchise’s reluctance to retire jersey numbers (the team prefers to “honour” numbers, meaning they raise a banner and leave the number in circulation for stiffs like Jonus Hoglund and Matt Stajan to wear), Keon has rejected endeavours for his #14 to be raised to the rafters. He reportedly refused an invitation to the closing of Maple Leaf Gardens because the letter the team sent to him read “Dear Former Toronto Maple Leafs player.” But this night was about a team, not about any single player, and the ceremony reflected that, as Keon was only afforded a minute-long ovation from the crowd before captain George Armstrong was the last to be introduced. Keon stood off to the right side, his body turned slightly off line from the others. He didn’t look thrilled to be there. Missing from the proceedings was the Stanley Cup, which featured prominently in recent ceremonies honouring Mark Messier in New York and Mike Vernon in Calgary. Indeed, it would have been special to see it hoisted one last time by this group, but perhaps the spectacle would have been a bit too bittersweet for a team that hasn’t hosted the Cup in its building for forty years. As for the business at hand, the Leafs managed to hold off the Edmonton Oilers by a score of 4-3 as captain Mats Sundin scored two goals, including the game-winner on a brilliant individual effort. The Leafs’ John Pohl and the Oilers’ Ryan Smyth also each notched a pair. Goaltender Andrew Raycroft made a clutch game-saving save amidst a furious Oilers rally in the dying seconds to preserve the victory. As for the old-timers, they’re not done just yet. The ’67 festivities continue this week with a gala dinner as well as an autograph and memorabilia show. Both events are at the Metro Toronto Convention Centre.